I bought a return auction of several Lego sets. I paid about $250 for a Technics Motorcycle, a Star Wars Y-Wing Fighter, a boxful of Minion Advent sets and a Death Star. The advent sets are brand new and the motorcycle was complete. The Death Star looks complete, but I don't know yet. The Y-Wing is what brought me here. When I went to open the packages, I found that they weren't sealed but rather taped back shut. Upon further inspection, I found that the pieces didn't even go with this model! The sorry so-and-so had bought the model, took it home, swapped the Y-Wing parts out for some dirty pieces and returned it as "missing pieces." Can you believe that? I was hoping that I could at least build something out of the pieces, but I had no idea how to figure it out. 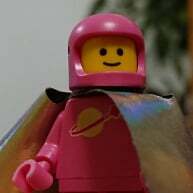 After I signed up here, I found out about Rebrickable. After spending several hours sorting and cataloging the parts - many of which were Mega Bloks and other generic pieces - come to find out, I don't have enough pieces to build anything! I used to be really into Lego when I was a kid - I got a new set every holiday - and I have recently gotten back into it with the Saturn V - the most beautiful rocket ever - but the kits are just so dang expensive! Anyway... looking forward to spending some time here with y'all! $250?! Don't get your hopes up about a complete Death Star. What do you mean by "Minion Advent" sets? Anyways, welcome to Brickset and enjoy your time here! and there are far too many [email protected]#king savages in this hobby! A complete DeathStar from a local thrift store was what got me back into LEGO, and it cost me under $80, so it CAN happen. Sadly, it sounds like you hit a bad lot. If you're looking for #8037 Anakin's Y-Wing let me know - I picked up a loose lot a couple of weeks ago with another one. What do you mean by "Minion Advent" sets? @Shib is correct. The Minion sets are Mega Construx. I didn't even notice that! You know... after the first three (the only three as far as I'm concerned) Star Wars movies, I didn't keep up with it. It looked like a Y-wing to me. Looking at the box again, it's the Krennic's Imperial Shuttle. Thank you all for your warm welcomes! Oh, that sounds like a good sign. I suppose it's believable if it's the old version, #10188. No... it's the new version... I't's going to be a while before we get around to building this behemoth, but I'll update this to let y'all know whether it's all there or not. Sorry for the delay in reply. For some reason, I'm not getting email notifications. Oh, lord... Good luck! It takes long enough trying to find all the parts when it's brand new (unless the new one uses a more refined bagging system). lol.. you and me both!